Artificial snow can provide enough snow by using the snowmaking machine during the entire ski season. In the early ski season, skiing ground almost completely depends on snowmaking. Once the natural snow lost its crystal texture, it will be spherical and hard to restructure. Compared to natural snow, artificial snow is easy to protect the quality of the snow in a long time constant, and better suited to resist the influence of sublimation and heat from the light source. Put artificial snow on the surface of natural snow, which can re-energize the crystal texture, so that the snow can restore vitality. Focusun specializes in exploring snow maker and delivery system which are totally compliant with the situation of customer's local place. Besides, our professional construction experience will be very helpful to offer different flake ice making system to meet your requirements. 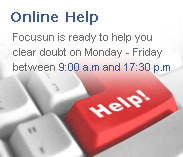 Focusun uses crushed flake ice to make snow. 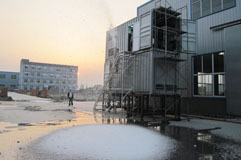 First, turn the water into the flake ice by ice-making machine ( thickness of flake ice about 1.5mm-2.0mm), be stored in a container with a refrigeration system, when the snow is needed, crushed flake ice into powder by ice crushing machine, and then through the air delivery system - closed high pressure fan, blow powdered snow in specified area, so as to achieve a scene of snow, to meet a variety of needs. 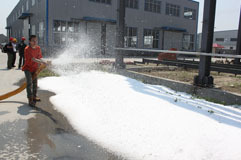 - Use flake ice as raw materials, large production, and can be adjusted, snow capacity can reach 1000-5000 cubic meters / day. - To meet the indoor and outdoor snowmaking. Snow's appearance crushed by flake ice is close to the nature snow, more aesthetic. - Without limit of ambient temperature, water temperature, air humidity, snow maker can work whole year. - Artificial snow conveyor system can be transported into the 300 meters, snow spraying straight line at the range of 25 meters can be delivered. - Artificial snow system is made into complete container system, reducing on-site engineering costs, as well as noise. 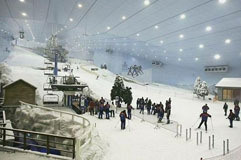 - Artificial snow system equipped with WEB intelligent monitoring security system, 24-hour control.